Mbazira is a resident of Kasambya Sub County, with two sons. 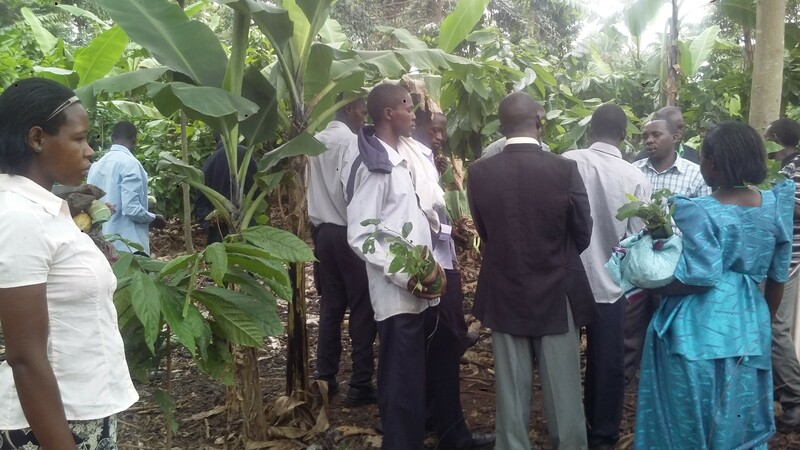 He has been working with World Vision Uganda to enhance his farm through FMNR practices. He is the member of St. Margret good Samaritan farmers group is the model farmer that has succeeded in integrated tree- crop enterprise with the aim of growing crops as the same time conserving the environment, he narrates his story how his income status was change as well as livelihood. When I saw the trees nearly getting finished, I decided to go for nature conservation where I allowed a lot of re- growth in my garden; this was achieved when I was selected to host FMNR demonstration site in Kakayo. I have a cool environment here and people enjoy coming here. My crops cannot be affected by sunshine because they are protected by trees. I was able to understand the positive relationship that exists between crops and trees through the skills attained as FMNR champions. I love nature and that’s why I reserved some part of my land as conservation. I now have 3.5 acres of coffee, 200 trees of avocados and 70 trees of jack fruits. In 2011 I received three seedlings of improved avocados and they are doing well in my garden. 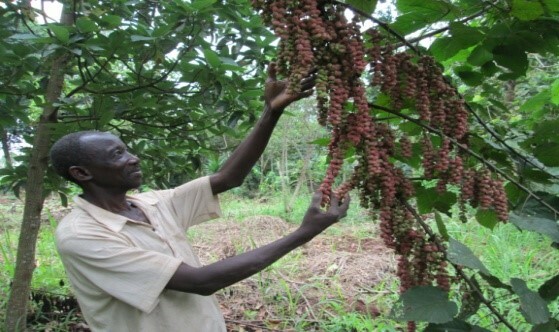 Integrated farming, particularly fruits, has made changes in my life and the community at large through the following ways; increased household income after selling the fruits which enables me to pay school fees in time, improved food security status, improved health through eating a balanced diet. After seeing that the trees were becoming extinct, I started growing jack fruits, avocados, and coffee plus leaving forest aside for nature conservation. I also have a very rare species of trees that have a lot of uses especially a pigmentation and colorings of hand craft products such as mats and baskets because of its good color. I have to make sure that I protect this tree because it cannot be got anywhere in Kasambya sub county because of its multiple uses. I sell its fruits to hand craft makers because it acts as a dye. This change helped me to get rescued from poor situation, creating a cool and pleasant environment, and I have become a champion in nature conservation. Through Word vision Trainings on farmer managed natural regeneration (FMNR), my forecast on what will happen in future when all the trees are cleared especially on our environment, is what is driving me to conserve nature. I do coppicing, picking mature fruits and taking to the market, sorting and grading, slashing and planting more fruits, weeding and harvesting coffee. I hope this change will help me to build a residential house, it also will keep creating a condunsive environment around the home stead and it will help my children learn and put into practice the concept of environment.